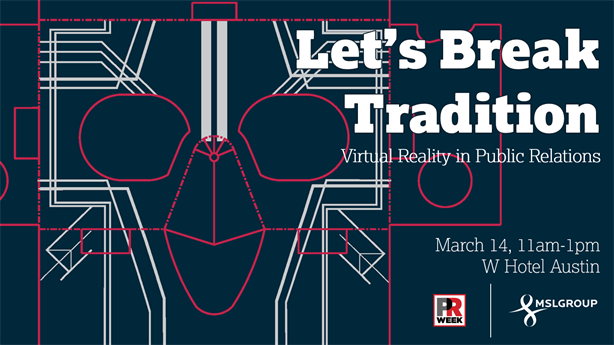 To help marketing and PR professionals get started with virtual reality, PRWeek has collaborated with MSLGROUP on a panel at SXSW featuring technology advocate Robert Scoble, Mitch Gelman of Gannett, Jon Hackett of Nurun, and Jeff Melton of MSLGROUP. Register here to hear panelists discuss the most creative ways to utilize VR for integrated marketing and PR. It’s the new, hot, immersive technology. At SXSW later this month, virtual reality will make its biggest stand yet with more than 70 panels at the interactive portion of the festival alone. Virtual reality parties are even being planned. "VR is going to be the most social platform," said Facebook founder Mark Zuckerberg while helping to introduce Samsung’s new S7 and S7 Edge handsets, the new Gear 360 video camera, and Gear VR. It’s not that virtual reality is new; it’s already here. And 2016 will be remembered as its breakout year: It’s become so accessible that equipment is even available in cardboard; video cameras that record in 360° are now affordable; the long-awaited high-end Oculus Rift product will finally ship; Samsung has rolled out integrated products; more than 20,000 360° videos have been uploaded to Facebook; and content on YouTube is soaring. According to eMarketer, not only are 80% of Generation Z Internet users interested in virtual reality, but so are 64% of Baby Boomers. Virtual reality promises the opportunity to tell amazing stories in a more immersive way. It’s a new way to be efficient — think potential home owners touring 15 houses in a single day. And it permits someone to experience something they would otherwise never be able to do, like a 90-year-old going skydiving or looking around Mars from NASA’s Curiosity rover. It helps build empathy by literally putting someone in another’s shoes. Virtual reality builds such a connection between the viewer and the environment that they meld together in what The New York Times recently called a "full-dress illusory world" enabling a greater "suspension of disbelief." As the Times pointed out, the effect is "neurological, technological, relational, and psychological." Not only the Times, but publishers and media companies from USA Today Network/Gannett to CNN are now offering VR content. What about marketing and PR professionals? Early thinking suggests VR represents opportunities on multiple levels. You can take influencers somewhere they aren’t able to physically go, immerse journalists in events and experiences, and not only grab consumer attention, but earn a greater amount of the time they spend. And, it is a strong new path to build a more emotional connection to your topic, the Holy Grail of communication. To build the industry’s first guide illustrating how to get started with virtual reality, PRWeek has collaborated with MSLGROUP on a panel at SXSW to discuss the VR starter kit, best practices, and some of the most creative ways to utilize the VR format for integrated marketing and PR. You can register for the panel here. Technical evangelist/futurist and social media powerhouse Robert Scoble will headline the panel. He’ll be joined by Mitch Gelman, VP of Product at Gannett (USA Today Network). Gelman is a digital media executive and Pulitzer Prize winner responsible for Gannett’s product roadmap, technology, programming and distribution strategies, and is recognized for his skill using emerging platforms to create multi platform content. Jon Hackett, director of Emerging Technologies at Nurun, will speak to client VR campaigns. Jeff Melton who leads tools and platforms at MSLGROUP will be the moderator and contribute the PR POV. At the end of the panel discussion, attendees are invited to visit the 'VR Mini Lab’ to explore recent marketing and PR work from brands like Movistar via the latest affordable VR headsets and the latest 360° cameras available.